The perfect combination of history and 21st Century engineering. Each hand-selected, hand-scraped engineered board is protected with our exclusive Duratina® aluminum oxide finish. This rich, low-lustre finish is backed by our twenty-year finish guarantee. Available in three species of native American hardwood and six authentic colors. 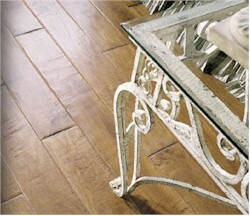 Let Virginia Vintage bring timeless beauty, traditional craftsmanship and enduring quality into your home.